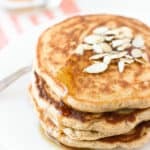 These honey almond crunch pancakes are tall, fluffy, and a whole wheat blend. Full of almond pieces for crunch and flax for a sneaky, nutritious add in! In a large bowl, add flours, flaxseed, baking powder, cinnamon, and salt and whisk to combine. In a separate bowl, add milk, honey, eggs, melted butter, and almond and vanilla extracts and mix until just combined. Add wet ingredients to dry ingredients and stir until just combined (it's okay if there are a few lumps). Fold in chopped almonds. Let batter sit for 5-10 minutes to allow the baking powder to better work its magic. Heat a skillet over medium heat and add a small pat of butter to melt in the skillet. Pour approximately 1/4 cup of batter per pancake (about 5" across) onto heated skillet, spreading batter evenly on the skillet to your desired thickness. Let pancakes cook until bubbles form on the top side and the bottom is a deep golden brown. Flip, and let bottom cook to same doneness. Repeat for remaining batter. You can use all all-purpose flour for the full 1 1/2 cups if you like. The almond extract is subtle (but present) in these pancakes as written above. If you're a big fan of almond extract, feel free to add more to your liking! I love to make up a big batch of pancakes, wrap them individually in aluminum foil, and freeze them. Perfect to quickly reheat on weekday mornings! I usually stick one in the microwave for a few seconds to bring it up to room temperature, and then pop it in the toaster so that the outside crisps up.